Introducing Villa St Helena - a luxury Byron Bay front row Hinterland estate located on the St Helena ridge, directly above Byron Bay. The property sleeps 12 adults (or up to 16 if the group includes children), with 7 bedrooms, 4 bathrooms and a spectacular 25m x 5m swimming pool with separate heated plunge pool/ 12 person spa, located on the Hinterland's most exclusive road and only 10 minutes’ drive from Byron Bay town and beaches. This iconic, double storey masterpiece has recently been reconstructed over 24 months and features modern, fresh and contemporary interiors, artwork, finishes and furniture. Timber formed tiles, crisp white walls and lots of glass showcasing the lighthouse, ocean and Hinterland views, which complement the contemporary nautical themes with modern, high-end furnishings and raw and natural fibres. Enter through double timber doors, beyond the perfectly manicured lawns, to an open plan and light filled downstairs space, complete with full Bosch kitchen and dining, dual living areas including, vast loggia with electric fireplace, 3 of 7 spacious bedrooms, 2 bathrooms and glass doors flowing to the generous outdoor entertaining and magnificent cabana. 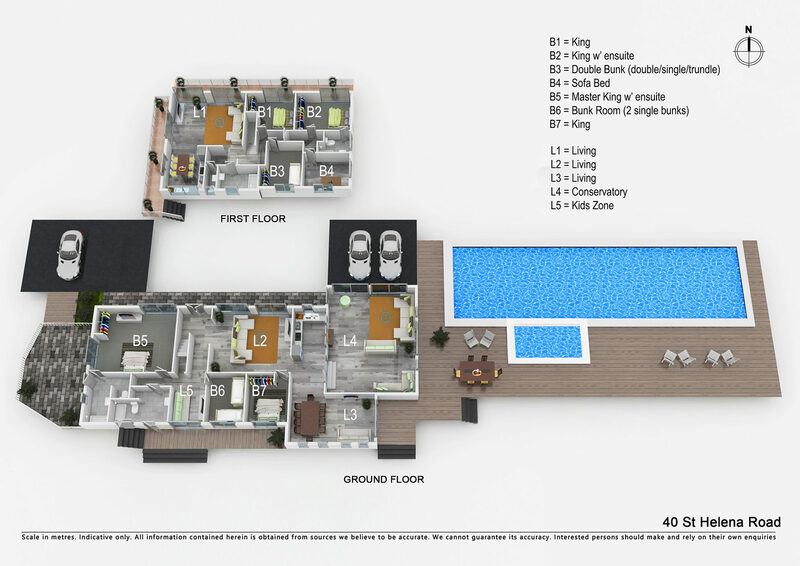 Upstairs features an additional large and modern Bosch kitchen, open plan living and dining spaces and wraparound balconies facing both to the west and the north, for stunning sunsets and breathtaking ocean and Hinterland views. The upstairs space also includes 3 large, light-filled bedrooms and 2 bathrooms (1 ensuite and 1 guest bathroom with huge stand-alone egg tub with views). There is an additional multi-function room that includes a desk and a double fold-out sofa bed, which can be used as an adjoining infants room, 4th bedroom or a study. Having recently undergone a further extension, Villa St Helena is an entertainer's dream, with a huge covered outdoor entertaining space with Webber BBQ, sun loungers, outdoor seating and a large timber dining table with bench seats. The outdoor space overlooks the sparkling 25m x 5m inground swimming pool and spa, which is framed by expansive timber decking and comes complete with comfy sun loungers and offers endless ocean and Hinterland views. Escape to the country and enjoy the privacy of this Hinterland hideaway in McLeods Shoot but drive only 10 minutes to the centre of Byron Bay, for access to world-class shopping, dining, entertainment and beaches. Drive just 6 minutes to the south to visit historic Hinterland village, Bangalow. Villa St Helena offers various living and dining options, with a large open design and comfortable, stylish furnishings. Downstairs, relax in a spacious cinema/living room on leather and vintage lounges watching Netflix on the 70" flat screen, with glass doors opening to the covered patio outside. Also, downstairs is an additional sitting room with flat screen TV and a large and open living space, complete with corner lounge, sofas and coffee tables, perfect for groups and families to enjoy separate activities, all in the same room. Wander upstairs and relax in another spacious living area, with large modular lounges, flat screen TV and glass doors accessing the covered balcony space outside. Downstairs, share meals in light-filled ambience at the large and modern timber and white dining suite within the open plan living and dining space. Upstairs, an additional timber and white dining suite offers 12 seat dining within the open plan kitchen space. Villa St Helena features two separate and stylish kitchens (one on each level), which are both exquisitely finished, with stone benchtops, quality stainless steel appliances and in sleek white cabinetry. 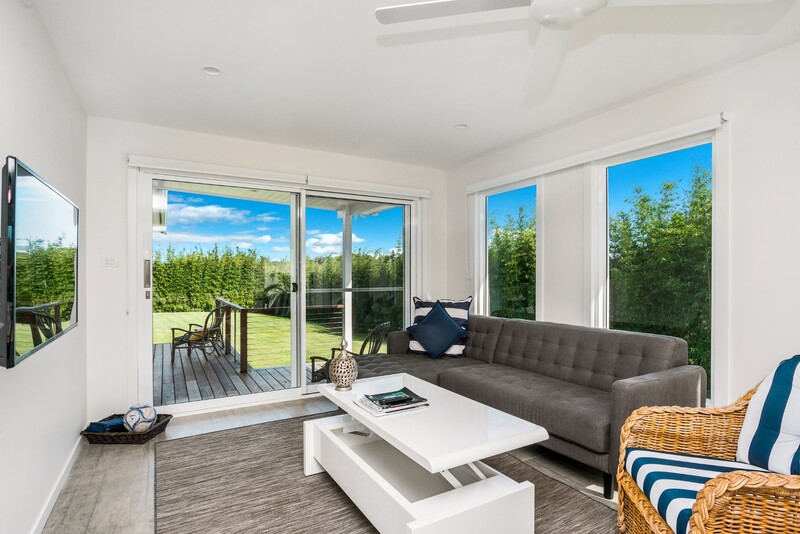 Ample windows allow for lots of natural light and both kitchens look out to tropical gardens, lawns and magical forever views. Spacious and luxury, the sleeping space at Villa St Helena offers flexibility, comfort and style. The bedrooms are bathed in natural light and simply styled, with crisp white, nautical stripes and plush bedding. Enjoy the convenience of 4 resort-style bathrooms at Villa St Helena, with an ensuite and a guest bathroom on each floor. 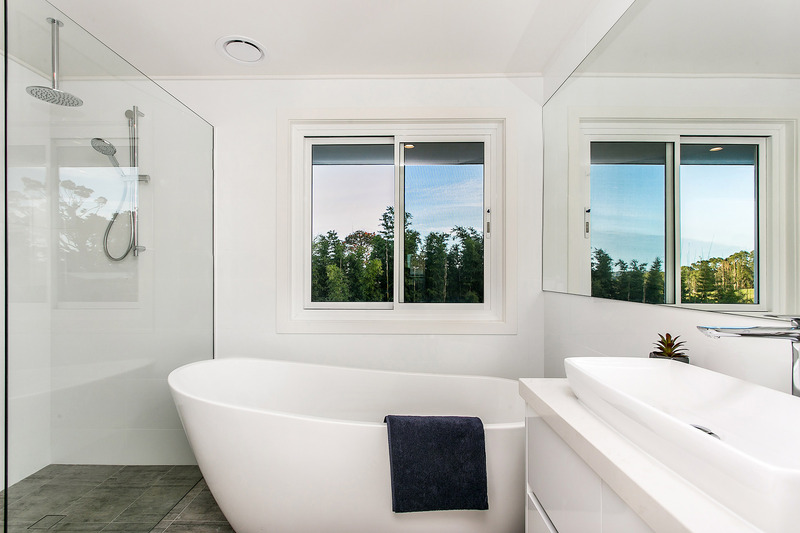 The bathrooms showcase modern, minimalist style with simple white cabinetry, frameless glass and double shower heads. Relax and unwind after a long day exploring Byron in the property’s deep freestanding bath. Recently extended, the outdoor space at Villa St Helena truly shines. A generous covered entertaining area offers al fresco dining, with timber table and bench seats, outdoor sofas and sun loungers and a Webber BBQ. Spend an endless summer in the stunning 25m x 5m inground swimming pool or relax in the adjoined spa pool, all while drinking in the spectacular ocean and Hinterland views. Relax poolside in comfy sun loungers, on the expansive weathered timber decking space. A manicured lawn sits beyond the pool area, all framed by the lush green expanse of the Byron Bay Hinterland. In addition, a covered patio wraps around the entire house on the lower level and upstairs, wraparound balcony spaces can be accessed from multiple rooms. Enjoy views to the north to Mt Warning and surrounding Hinterland, as well as sprawling ocean views. Breathtaking sunsets abound. Guests can enjoy complimentary Wi-Fi and Netflix during their stay at Villa St Helena, as well as ducted air conditioning upstairs, additional air conditioning in the downstairs master bedroom and ceiling fans throughout. There are 3 off-street car spaces at Villa St Helena. Experience the best of both worlds with the superb location of Villa St Helena which is nestled in the rural rainforest Hinterland in McLeod’s Shoot/St Helena, only 10 minutes’ drive to Byron Bay’s town and beaches. A short 6-minute drive to the south will reach the historic and happening village of Bangalow, a must-see Hinterland town with unique, quality shopping and cafes, coffee and dining. Bond of $2000 will be processed 1-3 days prior to arrival. We all had such an amazing time at Villa St. Helena! We all came up for a concert and it met all our expectations and more! Would definitely love to stay again! Love, love, love the pool room and outdoor area (spa/pool) however solar heating for the pool would have been amazing seeming we booked the house during the colder months and although it was sunny the pool was freezing and you could not swim in it. For all the money the property cost us for us not to swim was a real shame. The spa however was great and a decent size the kids loved swimming in it and the house truly did exceed all expectations, absolute paradise! The pool is awesome and the disco lights in the pool amazing.